And so, I lived to tell about it. Just about a week ago at this time I was playing “war” with a bunch of thirty year old men and a few ladies through the night. 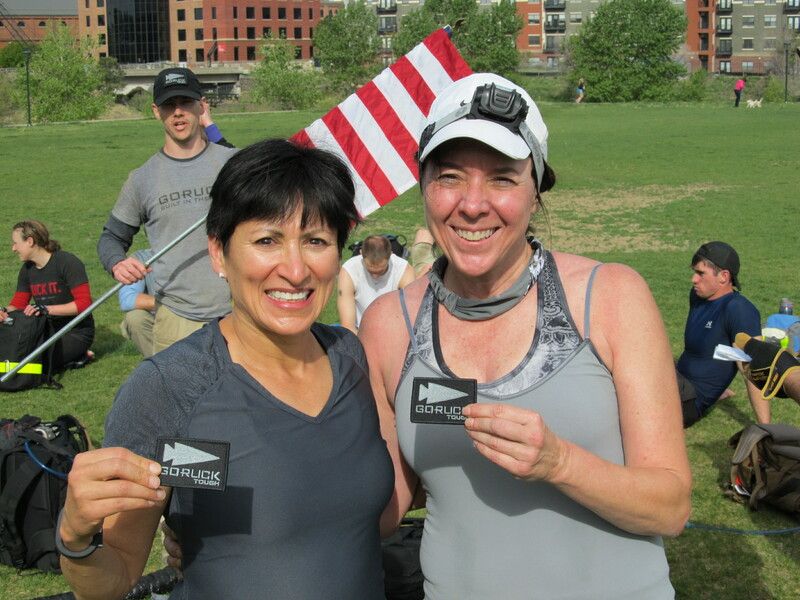 It was the GoRuck Tough Challenge in Denver. All I really knew about it going in was that it promised to be hard, was designed to break me, and required me to stay up all night carrying a backpack filled with bricks, do a bunch of military drills, be miserable, and probably get wet. In the end, 31 people signed up, 25 showed up and 22 finished. It lasted 12 hours; and, after 2.5 hours of military drills, we covered about 18 miles. Oddly, we did not get wet. 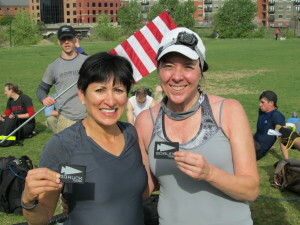 I was the oldest participant, but only by two months because my incredibly fit friend agreed to sign up as well. In retrospect, the word “grateful” doesn’t even touch what that meant to me. In some ways it really was like playing war with my brother when we were little. Jeep Wranglers (and there are a lot of them in Denver) represented “danger.” When we saw one we had to holler out “Wrangler” and “Freeze” until Cadre Greg (our leader) deemed the area clear and the danger averted. We only broke character once when a jeep turned around and came back at us producing momentary panic. When we came to a bridge we had to “pay a toll,” which usually meant some sort of physical exertion such as lunges (even if you happened to have a 200 pound log on your shoulder) or the elephant walk (don’t ask)! But, in most ways, I would choose the word “drudgery” over “fun” to define my experience. Carrying the bricks all night quickly became the least of my concerns; in addition to our packs we had to carry three “casualties” that consisted of 2 very heavy logs and a 150 lb. sandbag in a litter. Add two water jugs and the team weight (a 25 pound chain folded and wrapped), and it became clear very quickly that we all had to contribute and work as a team to get it done. And when we floundered, Cadre Greg brought us quickly back into focus with burpees or flutter kicks or other such torture. Thankfully, with about 3 – 4 miles to go, our remaining “casualties” were airlifted to safety, and we were instructed to run (fast walk, shuffle) our way back in. I remember feeling exhilarated at that point because I knew I was going to make it, running I could do! I ran in with the team, paid our infractions (more burpees), and received my patch; I turned 56 the next day. It was the best birthday ever! Now, a week later the entire experience feels a bit like a dream. My texts with my friend have gone from texts of exhilaration in which we recalled every moment of the experience, to texts of commiseration in which we spoke of sore muscles and bruises, to most recently, texts comparing notes on hot flashes. Life goes on. But make no mistake about it, I am forever changed. Time now to re-examine my training, get my nutrition straight and move on to another adventure! An educator by trade, runner, hiker and adventure-seeking fitness enthusiast by passion. She explores what it means to be fit after fifty along with the multiple joys and trials that come with age. She is truly an Athlete On Fire! Newer Post BU:07 Becoming Ultra: The guide to your next trail half marathon from Ian Sharman. Older Post BU:06 Becoming Ultra: How to train smart after an injury.